There is a particular pleasure to rituals, whether inherited, or made up. Such is – for me – the January 1 action movie that I watch with Philip on DVD, as we finish a slow day, started late, purging the excesses of New Year’s Eve. This year, it was Ant-man. To talk of celebrating a ritual, the Chinese say ‘过节’. The character 过 refers to the physical act of crossing a river or a road, but is also used as a grammatical particle to mark a form of the past tense, equivalent to the English past perfect – I have been, I have gone.节 refers both to a festival, and a joint. Celebrating festivals is therefore represented as crossing an articulation in the skeleton of time, and transforming a past period into an experience. Rituals accompany this transformation. 2015 has become our past. By celebrating New Year, and accomplishing the rituals that accompany the celebration, we make it history, converting the loose threads of remembered moments, images and sounds into patterns of meaning and causality. We cross the border, and move onto the next segment of our articulated lives, 2016, January, the new cycle. And so the wheel turns, rituals marking each of its spoke: Australia Day, Easter, Bastille Day, August 15, Halloween, Christmas – celebrations we share – and our own personal ones: birthdays, anniversaries. Cyclically repeating, every year. In Australia, as in France, it is common to make resolutions with each new start of the cycle – committing to doing one thing at least differently. Not so that our lives will spin into a different groove; but so that our spiral may go both higher, and deeper. In October last year, I was living in Nanjing, and I organised a translation night at a local cafe, with the Nanjing University graduate student English club. The local branch of an Australia-China Youth Association partnered with us. Their role was to bring in Westerners – their people told me they would have no problem bringing in 10 or 15 people. But on the night, only one Polish girl turned up. Furious organisers from the Nanjing University graduate student English club requested apologies – which I managed to deliver. They had brought 25 people, expecting interactions with foreigners, why did I promise ten, and only one came? There was not too much harm in the end, but some disappointment. I later debriefed with the president of the partner Australian Youth association, and another Australian friend. ‘What time was your event?’ one of them asked. ‘6h30 to 10pm’, I replied. Both Australians had a smirk: ‘Now that makes sense. People just won’t come at that time. It’s a Saturday evening, at 6h30 they’re preparing dinner, then they’re having dinner, and then they’re going out for a drink.’ The tone was condescending, but I stood my ground. ‘People won’t come at that time? Well,’ I replied, ‘twenty five Chinese people came. We might have to deal with a cultural issue here.’ Yet I wasn’t really surprised – neither by the touch of unconscious racism, nor by the poor rate of showing up among Westerners. 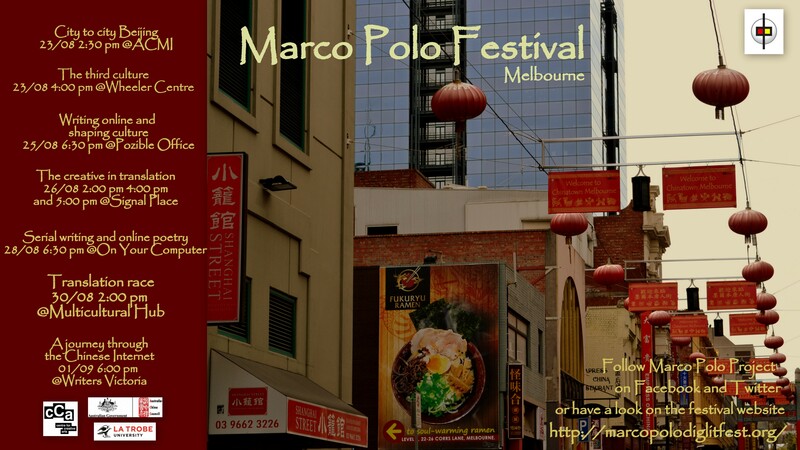 When I organise events in Melbourne, Aussies rarely come – while Chinese people do turn up. On the night, in Nanjing, I ended up chatting with three people who’d come as observers. As I found out, one was the head of the Nanjing University Business club, one was the head of the international club, and the third was a friend of theirs, managing editor of a Shanghai-based online magazine specialising in digital media. They’d heard of our event, and were interested. I went out for dinner with them – a local street restaurant, serving the best barbecue fish in town. Another friend was with us, highly educated Chinese woman writing a Master’s thesis about the reception of European modernism in China. Our conversation was warm, smart and friendly – the Chinese internet, the Chinese video games industry. Then we spent a long time comparing the power structures of the communist party with those of the Catholic Church, alternating between English and Mandarin. I became good friends with these three guys – and as it turned out, through one of them, I found myself one handshake away from Mohammed Yunus, and connected with a group of Guangzhou based innovators and IT entrepreneurs. I think these people will do stuff – and I built the foundations for ongoing relationships with them. How did I achieve that? I rocked up at an event, and I demonstrated a respect for culture. The Victorian government organised a trade mission through China, which culminated in a Shanghai event at the Pudong Shangri-La. Hamer scholars were invited alongside alumni of Australian Universities to meet the delegates and a few Victorian ministers. The formal part of the ceremony started with a moving speech by a very wealthy Chinese investor who told us about his time of studies in Melbourne, where he discovered the full value of education and curiosity – which he called ‘the Australia spirit’. In his reply, our Premier expressed his own version of ‘the Australian spirit’, by quoting at length how much income Victoria derived from education exports, in full dollar value. Was I the only one to wince and experience a tinge of shame? The overall event organisation was chaotic, unsurprisingly, given the large attendance. There was a table plan for the dinner, and coloured laniards for each profession. I tried explaining I worked in the cultural sector, and was there a colour for that? But the Chinese hostess replied, pointing to a pile of laniards: ‘purple is for education, no culture’. I later wandered across the tables, and bumped into one of the organisers. ‘I’m trying to find a table with people working in the cultural sector’, I said. ‘Good luck’, she replied, and left. I ended up sitting alongside a very nice young Chinese woman, who worked in a bank, but considered a career shift to language teaching ‘I’m a Christian, I like to help other people’. Other people were boozing up on Yarra Valley bottles, while an ad about ‘Dairy Victoria’ rotated on the centre screen. I left early to get back to Nanjing, slightly bitter – with a sense of lost opportunity and misalignment. In December, I went on a ‘great trip down south’, to Guangzhou via Wuhan and Changsha. I had never heard of Changsha before, and Wuhan was just a name on the map. I learnt it used to be the centre of ‘Chu’ culture, one of the three great cultures of Ancient China; the Dao De Jing manuscript had been found nearby; it is called ‘the Chinese Chicago’; ten million people live there. I visited the Hubei Museum, and was confronted headfirst to thousands of years of history – and a tradition I was entirely ignorant about. I would normally count myself as well-educated. Yet in this museum, for the first time in many many years, I felt a very deep and almost shameful sense of ignorance. There’s a quote I really like by Sergio Pitol, a Mexican diplomat and writer, back-slapping Americans: “in my country, it’s not respectable to be ignorant”. There’s a special beauty to the Chinese smog. It’s not only the shades of pink and grey, but the way it affects our perception of these old cities – from a distance, it blurs away the wrinkles. I chose to live not far from the river. I try to walk there every day, sometimes in the morning, sometimes at sunset. Surprisingly, not many people seem to do that. The few friends I’ve taken along all found it peaceful and relaxing, yet they would never come on their own. Most of the riverside people are regulars, elderly couples, women with dogs, probably locals. One of them I call ‘the sentinel’: a short man with a square face, in his late fifties or early sixties. 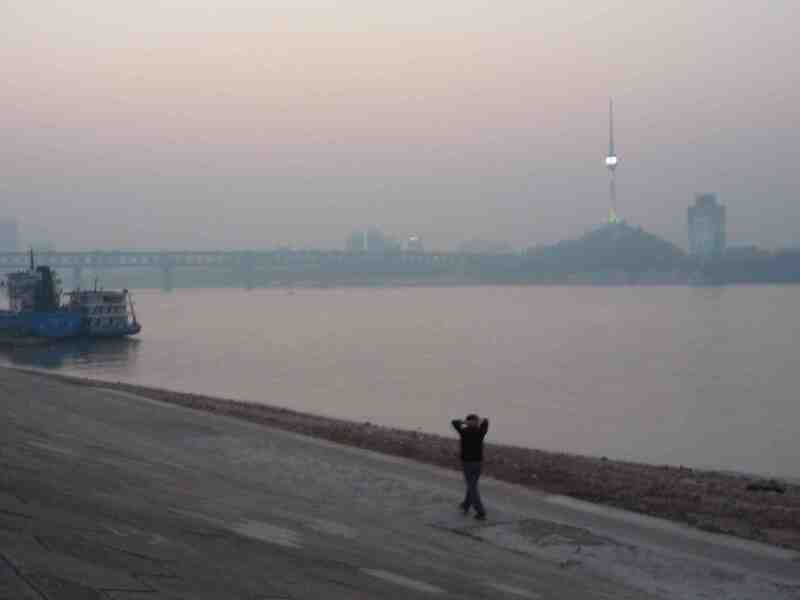 He sits on a bench opposite the TV tower, wears tinted glasses, and looks out across the Yangtze to the towers of Hankou. I’ve seen him before sunrise, and I’ve seen him after sunset, but I’ve never seen him in the broad daylight. Sometimes, he plays traditional music from a small radio, and once he was practicing Tai Chi, but most of the time, he’s just sitting there, watching. Is this man a corrupt official who made his fortune selling construction permits, and looks across the river at a real estate empire that his pen authorized? Is he the local mafia boss dispatching orders across the gambling underworld from this inconspicuous riverside bench? Or is he living a peaceful retirement funded by a rich son, cosmetic surgeon in Phoenix, who returns home once a year with a suitcase full of dollars? Every time I see the sentinel, I make up a different story for him, and let my shapeless fantasies of China cristallise on his static figure. Today, I’ve decided he was a retired public servant enjoying the contemplative pleasures of an early State pension after a lifetime pushing papers at the marriage registry. The reason I think about this man so much is sheer loneliness. I build imaginary worlds around him, because if they were true, then I would be part of the local story, even as its anonymous narrator. And this illusion keeps me sane. It’s a sad story, but it’s not an original one. I came to Wuhan two years ago. I teach maths in international schools, and after years in Latin America, I wanted to try something different. Central China wasn’t my first choice, but the conditions were good: high salary, reasonable working hours, and a three-year contract. Shanghai and Singapore both rejected my application, Wuhan was the best offer, and I moved here. 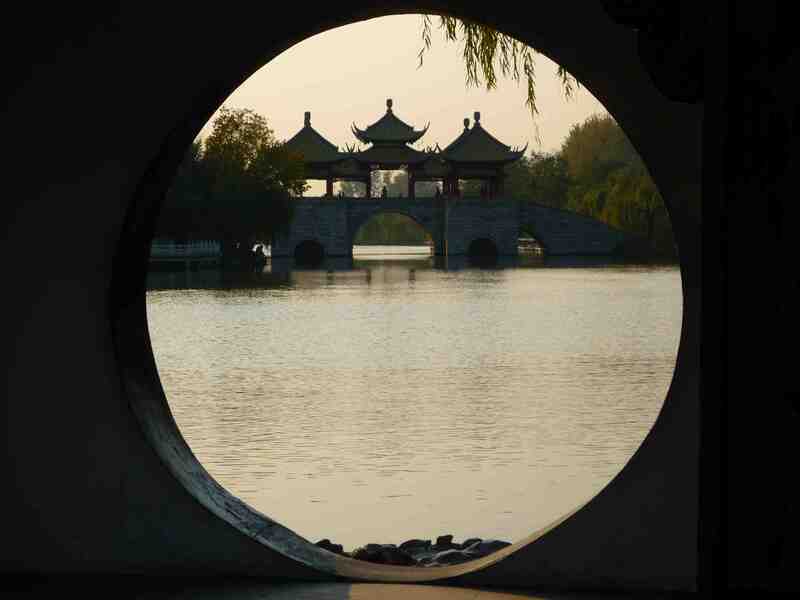 I didn’t have any friends in this part of China, but I’m sociable, and thought I would quickly meet people through the school and on the local expat scene. I was thirty-two when I landed, single, and looking for no more than casual company. I didn’t expect I would fall in love, especially with an expat. It was months of extreme happiness. We met after class, and walked along the river holding hands, kissing in the soft pink light. We took the metro to Hankou for late-night snacks, went boating on the lake, and visited nearby cities on the week-end: Jingmen, Ezhou, Huangshi. But her studies ended, she couldn’t get her visa renewed, and she flew back to Bologna. That’s when my depression started. I’ve been an expat teacher for the last eight years. It’s a good life: good money, good work, and a sense of adventure. When you’re tired of a place, you move on: and it’s a new culture, a new language, a new landscape. New bars, new friends. But after Giulia left, I suddenly felt old and empty. I thought of doing the romantic thing, leave my job in Wuhan and follow her to Bologna. But there was nothing for me there. ‘Italy’s hard’, she repeated, ‘I’ve got friends with two, three Masters’ degrees, and they can’t find a teaching job.’ We calculated, cost of living, rent, average salary: the figures didn’t add up, and I didn’t have the courage to risk all my savings on this relationship. So she left, and I stayed. New bars, new friends – but nobody like her. Slowly, I retreated from the expat scene. I stayed home after class, reading everything I could find about China: travel books, history books, novels; blogs and wikipedia pages. I spent all my week ends inside museums, trying to memorize every sign, remember the details of every piece on display. Giulia was gone, but if I could absorb China, then staying in the country would make sense. After six months of this routine, on a Monday morning, I woke up from a Chinese dream: for a moment in my sleep, I had become a Chinese person. I was an old scholar sitting at the top of a mountain, under a pine tree, listening to the songs of birds. Then I was inside a pavilion, with painted red pillars and a phoenix on the roof. A slender cage hung from a rafter, and inside, there was a mechanical bird of shining gold, who spoke words I didn’t understand, but sounded like human language. I started noticing new things around me that day – the crispy sound of cooking crepes on the street, the smell of chilli, the shrill mix of women’s voices. There were still clouds in the sky, but the worst of darkness had passed. That evening, for the first time since Giulia left, I walked along the river. That’s when I first saw the sentinel. I remember him very precisely: the brown fabric of his jacket, the square shape of his face, the tinted glasses, and the closed wide lips. He sat on a bench, facing the TV tower, perfectly still. I stood behind him, and started telling myself stories about his life. That first time, fragments of my dream merged in with his figure: I imagined him as a bird-seller from the nearby pet-market, training jays and magpies to greet their future owners with a clear ‘ni hao’. I slept well that night, and woke up with an appetite for life. I came to the river again before class, and he was there. This time, I thought of him as a former air-traffic controller for the Chinese army, projecting complex ballets of landings and take-offs on the pink empty sky – then, anxiously picturing enemy planes invading the landscape from the North, dropping bombs on the new constructions, erasing in a day the physical traces of Wuhan’s modernity. I’m standing behind him now, very close. He’s mumbling something in the local dialect, which I don’t understand. He doesn’t seem to notice my presence. It’s the first time I’ve been so close to him, and I can feel a strange sort of cold coming from his body. Then to my question ‘why’, reluctantly, she replies with a single word: ‘ghost’, and walks away. The sentinel hasn’t moved. Now I expect him to dissolve into the mist, or turn into something terrifying and run towards me with a gaping mouth, but he doesn’t. I wait a while, then I smile at him, and mumble: ‘See you tomorrow, buddy’. NOTE: This story is the fourth in a planned series of #52, recomposing my memories of a term in China through fiction. All characters appearing in this work are fictitious. Any resemblance to real persons, living or dead, is purely coincidental. This story was written with the help of DraftQuest. Image and story are copyright @julienleyre.